BOOK: The measures taken and the accusations laid by western governments, mass media and public opinion against Russia and Russian president due to the Ukrainian crisis of 2014 and the recent actions in Syria are just the newest expressions of the attitude born a thousand years ago. Starting from the times of Charles the Great, Guy Mettan surveys the religious, geopolitical and ideological foundations for the several century-long phobia of Russia widely-spread first in Europe, then also in the United State of America. 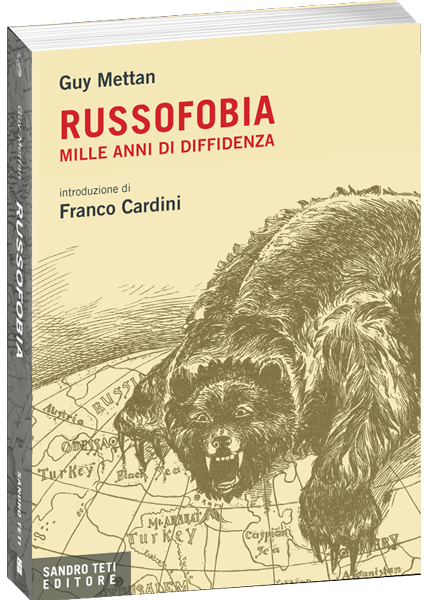 Taking a critical insight into the sources, the author reveals the weak points and mystifications of the prejudice forcing the West to maintain its tendency to hate the Russian “bear” and fear this country’s presumed imperialism. AUTHOR: Guy Mettan is a journalist from Geneva, historian, politician and an expert on Russian geopolitics. He is the founder and the director of the Swiss Club of Press. After his professional start on the pages of Journal de Geneve, Mettan cooperates with different magazines and reviews until becoming the editor-in-chief of a prestigious newspaper Tribune de Geneve. Then he starts his political activity joining the PDP central movement (Popular Democratic Party) and becomes the municipal counselor of Geneva. Guy Mettan is the author of numerous books on the history of his city.